Ceramic Food Bowl Blue 9"
Ceramic food/water bowls are practical and durable, Durable, heavy-duty stoneware design reduces tipping and spilling. Great for making foraging food! Chew-proof, high-glazed food bowls are sanitary and dishwasher safe. Comes in cobalt blue. 9" Diameter x 3.3/8" High. Weighs 3 lbs. Ceramic Food Bowl Fluted Design 7"
Ceramic food/water bowls are practical and durable, Durable, heavy-duty stoneware design reduces tipping and spilling. Great for making foraging food! Chew-proof, high-glazed food bowls are sanitary and dishwasher safe. Comes in chocolate only. 7" Diameter x 3" High. Weighs 2 lbs. Ceramic Food Bowl Geometric Design 7"
Ceramic food/water bowls are practical and durable, Durable, heavy-duty stoneware design reduces tipping and spilling. Great for making foraging food! Chew-proof, high-glazed food bowls are sanitary and dishwasher safe. Comes in assorted colors of our choice. 7,5" Diameter x 3" High. Weighs 2.5 lbs. 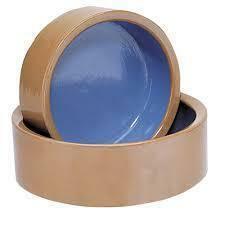 Ceramic Food Bowl Assorted Colors 7"
7" Diameter x 2.5" High. Weighs 2.2 lbs. Ceramic Food Bowl Assorted Colors 8.5"
8.5" Diameter x 3.25" High. Weighs 3 lbs. Assorted colors*. Marbled finish. Comes with bolt-on cup holder. Measures 3 1/8"D x 2 1/2"H with a 1/2" lip. Total diameter is 3 7/8"
Assorted colors*. Marbled finish. Comes with bolt-on cup holder. Measures 4 1/4"D x 2 3/4"H with a 1/2" lip. Total diameter is 4 3/4"
Assorted colors*. Marbled finish. Comes with bolt-on cup holder. Measures 5 3/8"D x 3"H with a 1/2" lip. Total diameter is 6 1/4"